The Post notes (with considerable understatement) that variable tolling "has generated criticism" because of high tolls in the so-called "Lexus lanes" on I-66, I-495, and elsewhere in the region. But not to worry, silly rabbits! 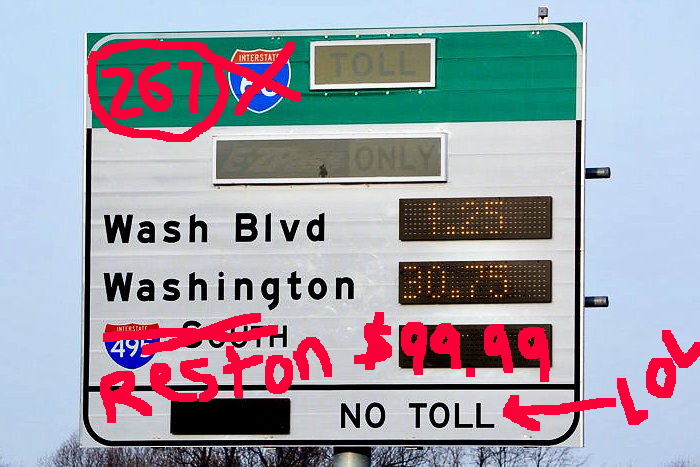 This is the Toll Road we're talking about, and like Reston, it's special! For starters, it carries the "special" debt from building the Silver Line, which riled up a bunch of people who see mass transit, like other functional government services, as something they shouldn't have to pay for as they drive alone to their strapping-bombs-to-dolphins contracting jobs, but we digress. What is extra special, though, is that the contract for the Toll Road "equipment upgrade" has been awarded to the same company that gouged developed the I-66 tolling process. So all demureness aside on the part of MWAA, it's a good bet that variable tolling will happen at some point. The next projected toll increase — to $4.75 — for the main toll plaza and one ramp transaction — is scheduled for January 2019. By 2043, the rate could increase to $11.25; by 2048, the final year tolls are projected to rise under the current schedule, the rate would be $12.50, according to budget documents provided by MWAA. Who knows, maybe the variable tolling will help spread out those increasing costs and mitigate congestion in a sensible way, just like it's supposed to. Or by 2048, maybe it'll be the dolphins who will be commuting to strap bombs to us, the end. Prediction - the eagerness of county and local state officials to "fix" road congestion problems by adding expensive tolls and encouraging expensive, poorly operating public transportation will result in election of a demagogue politician. 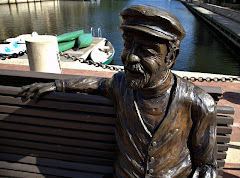 The demagogue politician will rail loudly on local transportation failures while hiding other unpopular views. He might even pretend to be anti developer on the campaign trail and then sell out the county once elected to a degree worse than the current set of clowns. Eventually, the voting public will begrudgingly be forced to vote back the establishment clowns who think their brand of selling out makes the world better.